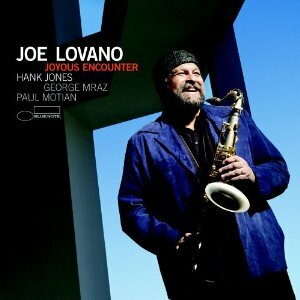 Joyous Encounter, Joe Lovano’s 17th recording for Blue Note, is an anomaly in his extraordinary career, as it marks the first time that the saxophonist has returned to the studio with the same band to record a sequel of his last outing. The new disc is part two of his celebrated 2004 quartet record, I’m All For You: Ballad Songbook, a masterwork featuring Hank Jones on piano, George Mraz on bass and Paul Motian on drums. Lovano, whose discography is expansive both stylistically and thematically and who regularly changes ensemble configurations from one album to the next, decided to revisit the quartet magic, this time with a broader range of tempos, rather than rev up another one of his projects waiting in the wings for documentation. It’s extremely rare that a band of this caliber has the experience of playing together before the recording session. Joe, Hank, George, and Paul are without a doubt a gem in the jazz community, having played as a collective for nearly two years now, familiarity and simplicity shine brightly on every track. By downloading, you can share this video with your friends.